In the next few weeks, we will see Facebook expansion on "like" button and will be able to use Reaction, the company tells Bloomberg. 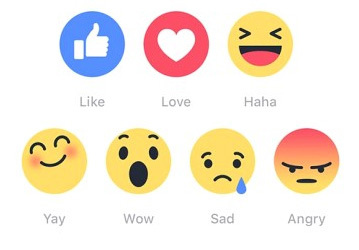 Originally, they were six reactions(angry, sad, wow, haha, yay, and love) in Facebook but the company choose to keep only five reactions after testing it in different markets Ireland, Chile, and the Philippines. The five reactions will be: angry, sad, wow, haha and love. Facebook has decided to remove "yay" as this emoticon was not universally understood. 2. All the new reactions will display..
3. Select the one you like to use..
No Comment to " Facebook's New Emoji 'Likes' are Just Weeks Away "